Planning a vacation or quick getaway, You'll go far by checking out the travel specials only available to military personnel. There is no such thing as a perfect vacation. It's good to remember that plans can go awry and tempers can flare just as they can at home. Equally important is planning ahead with each family member's needs and interests in mind. A vacation can be more successful if you do some planning and talking about everybody's expectations. (877) 263-5937 - Hours of Operation 7:00 a.m. - 10:00 p.m. Central time, Monday - Sunday. There is no fee for booking online. 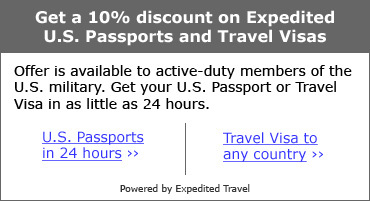 American Airlines has extended through July 31, 2008, several special offers that are available exclusively for active-duty members of the U.S. military. These offers include discounted airfares, relaxed advance purchase requirements, and preferred boarding privileges. OffDutyTravel.com offers special travel deals for Army personnel on air, cruise and other travel related services. US Airways offers special rates to Army personnel with their Military Leave Fares. Go Greyhound and get a 10% Discount with their Military Fare. Space available travel, commonly known as Space-A, is a way for Army personnel and their families to ride free or for a small fee. Immediate family members of military personnel have the opportunity to travel within the continental US on military aircraft on a space available basis under an extended pilot project. The one-year test policy began on April 1, 2003 and was set to expire on March 31, 2004. Now, officials have decided to extend the program pending the issuance of final rules to make the family friendly benefit permanent. Read the latest release on this new policy. Learn more about the Space-A program and how you can take advantage of this great opportunity. The AFVC is a "Space-A" vacation condominium rental program developed to benefit members and employees of the US Uniformed Services, National Guard and Reserves. Condos at privately owned resorts normally sit empty when the owners aren't using them. Now, rather than let these condos go unoccupied, AFVC makes them available to eligible individuals for a flat rate of only $249.00 per week! Q: How do I find out if I am eligible? Q: Do I have to be a member to use the condominiums, or listen to a presentation? A: There are no membership applications to fill out, fees or dues to pay, or timeshare presentations to attend. Lowest Hotel Prices. 110% Guaranteed. Book Now at Cheap Tickets. GovArm.com provides leisure and vacation travel services for government and military personnel, including retirees. With services ranging from condominium rentals, cruises, vehicle rental, and hotel reservations, to golf discounts and vacation packages, there is something for everyone. Help Our Troops Call Home! Now anyone can purchase a prepaid AT&T calling card for troops downrange. Order online from AAFES. For our troops serving overseas in Operation Enduring Freedom and Operation Iraqi Freedom. SatoTravel is honored to support the men and women serving our country in the U.S. Army. We have worked alongside the Army for nearly 50 years providing travel services in times of conflict and peace, on US soil and abroad, for official and unofficial purposes. Click Here for Army Vacations.